MMMMM... food. 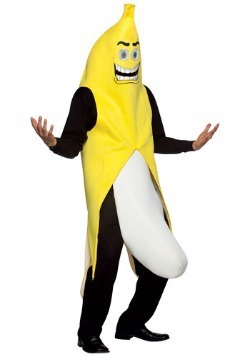 The staff here at HalloweenCostumes.com could go on and on about our favorite topic. Some of us are foodies who strive to satisfy the palate in bold new ways. Others are bakers extraordinaire who spend the entire weekend engaging in cupcake wars. And there's a large contingent of us who are happy enough with pizza or a cheeseburger. And of course there is one food item that rules them all... BACON! 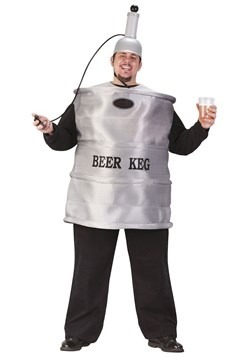 When it came time to assemble our collection of food and drink inspired costumes, we didn't have to search far for inspiration! 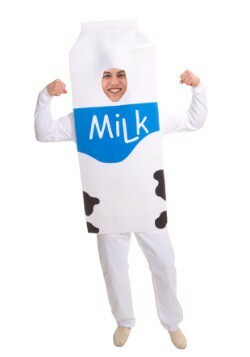 We have a large collection of food inspired polyfoam tunic costumes, which make for a super easy, super funny costume. 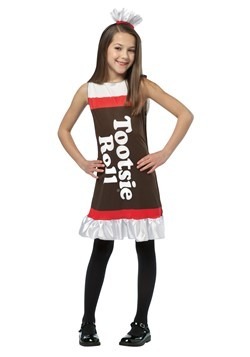 You can finally spend the night as your favorite treat! We've also got candy, cupcakes, ice cream, condiments, fruit, vegetables, your favorite brand mascots, the list goes on and on... 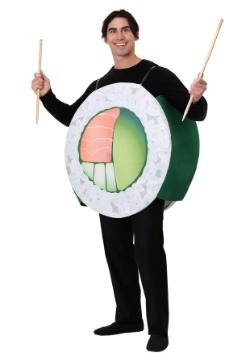 These costumes go great by themselves but are even better when you round up a group and have a food inspired party! The possibilities are endless and are only limited by your imagination, and of course your appetite. 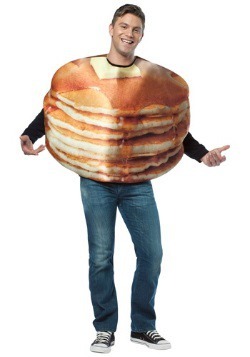 You might want to have a snack handy when browsing our Food Costumes, because a few hunger pangs are sure to follow! Are you familiar with the post and pre-breakfast snacks? Have your friends and family come to rely on you as a late-night chef? Are your social media feeds full of delicious food that are photographed with appetizing filters? Forget sugar plums dancing in your head, your dreams are more varied. 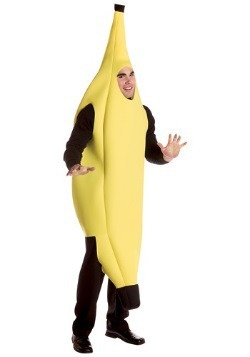 You dream of cheesy potato wedges and banana splits that wrap around your neighborhood. 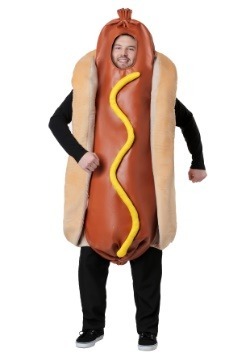 Whether you're a foodie or an eater, someone like you understands dressing up for your neighborhood's annual hotdog race or heading out as an avocado to celebrate the grand opening of the local farmer's market. 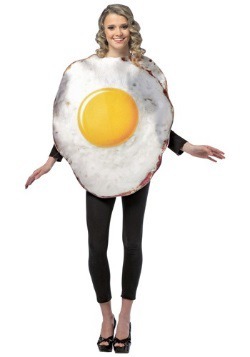 Not only do we have food Halloween costumes, but we also have eater lifestyle costumes! Is there anything more satisfying than biting into a burger when your hunger pangs just won’t take celery sticks for an answer? You’ve been working hard in the yard all day and the sun is setting. You head to your favorite burger joint, be it the little diner down the road or a day-to-day drive-through. And once that meal is in your hands your stomach lets you know that all is once again right with the world. Don't just eat your favorite entree, celebrate the savory patties of your past with these hilarious and appetizing fast food ensembles. The burger as a tasty treat was invented for life on the run but some many of us have found real love between the two sides of a sesame bun. 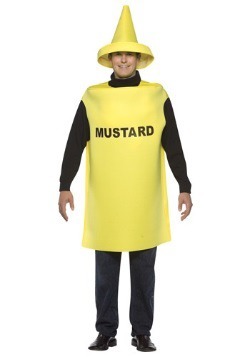 That's why when people see you rocking this hamburger costume, no one would dare give you beef. 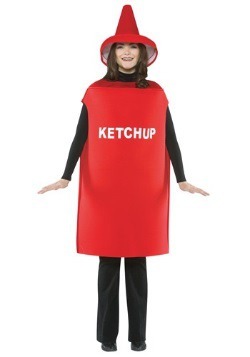 Your fast food fanatic friends can join in on the group costume. 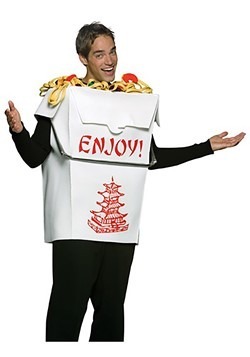 Some can dress up as characters from nostalgic fast food commercials, giving you all a great excuse for snacking on fries and burgers at that next costume party! Put your friend Pattie in a burger costume and your friend Frenchie in a one of those French fry costumes, and don’t forget pretty May, she could even wear a Mayonnaise costume. 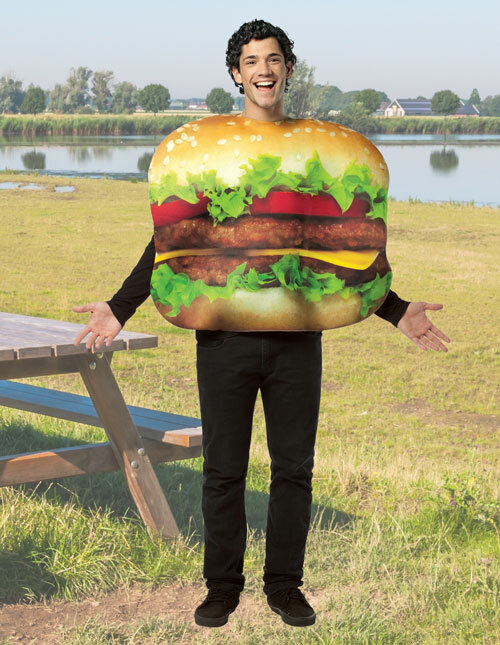 This hamburger thief and a hamburger clown costume is sure to be the perfect complement to any delicious look. 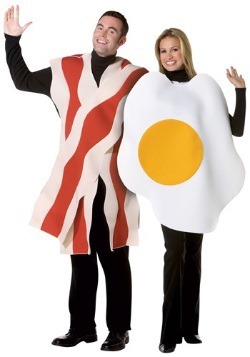 Paired together, these two are sure to have that "best costume" award in the greasy to-go bag! 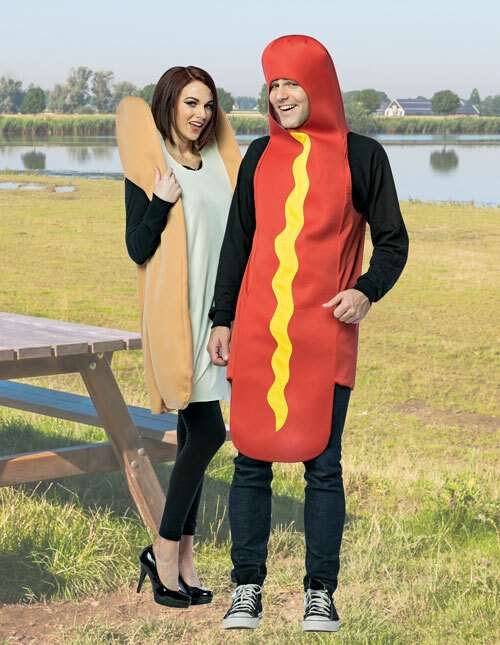 Wear them as a group costume paired with our adorable children’s hamburger costume or order them à la carte, either way they are sure to be Instagram worthy and leave you feeling satisfied! When dinner calls for a little more flavor, spice is there for you! Whether your tastes lie with the sweet and peppery flavors of truly spicy salsa or you dream of the simple cheesy lettuce, meat, and cheese combos of your childhood, we should honor tacos for the joy it has added to our lives! After all, if it weren't for zippy pepper sauces that flavor our carne asada tostadas we might not know the meaning of happy tears. There aren't many foods out there that you can eat for every meal and still crave more of. Think about it, there's a day dedicated to this food every single week. The amazing taco Tuesday is celebrated by schools, restaurants, and people who like flavor everywhere. We all should know by now that taco costumes are one of the most versatile costumes out there, even your pup, Fido, can join in the fun. 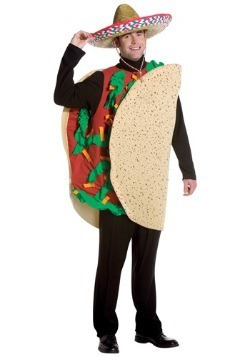 Prove your love of tacos and wear your taco costume every Tuesday! What's is the root of all our flavor sensation happiness? It's the magical chili pepper! 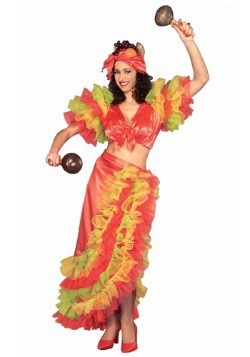 You'll spice up any party with this red-hot costume. The good old chili is the base for flavors throughout the world from chili to Chinese shrimp stir fry and if you really want to get wild, mix it with chocolate. 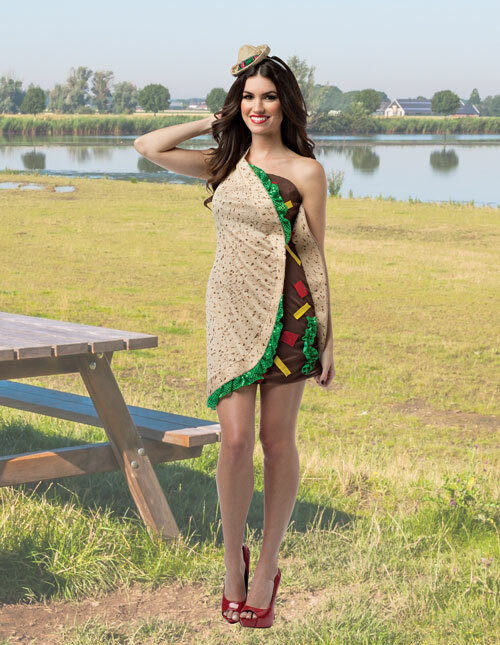 This spicy-hot costume is the perfect ensemble to accompany your date's taco costume. Do you remember a time before Siracha? We've cast all those bland memories out! Most everything is more flavorful now with a simple squeeze of the rooster sauce bottle. When you show up as this popular flavor maker you're sure to be in high demand from costume parties to food truck soirees. 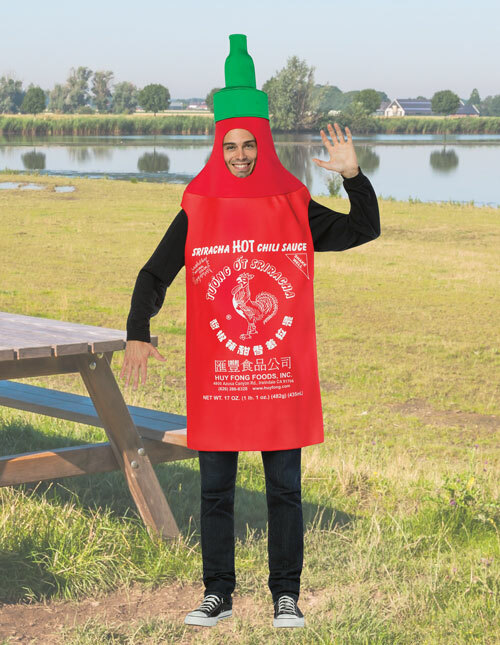 When you've got a Sriracha costume in your closet you're sure to find plenty of excuses to put this hot number on! 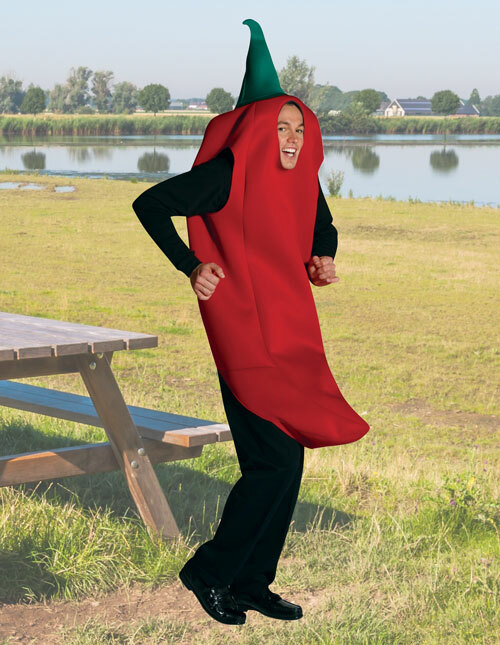 Are all these spicy costumes overwhelming you? 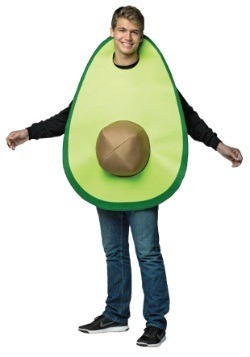 Keep the flavor and your cool with this fresh and succulent avocado costume. Just because you’re providing relief from spicy flavors doesn’t mean you’re taking away from the flavor profile. Love avocado but want your look to take a millennial turn? 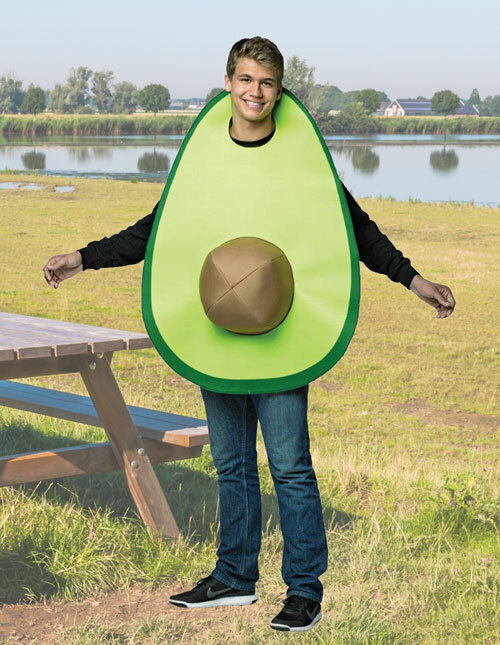 Apply your love of this verdant fruit to our avocado toast costume and become the toast of your generation! Well rounded, home grown, and good for you. 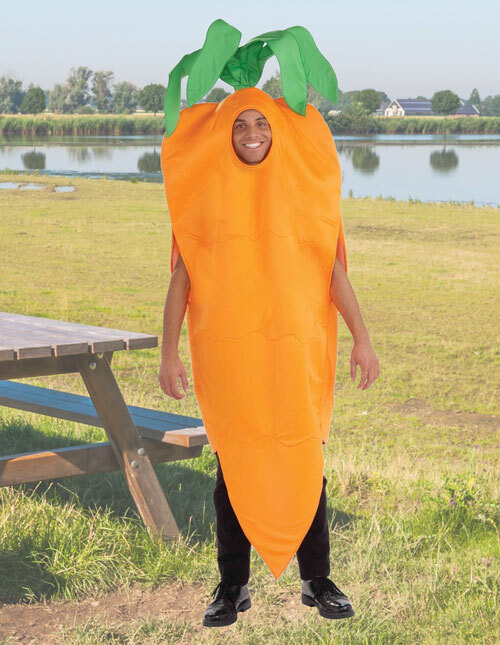 These veggie costumes are sure to be a hit at the farmer's market and a fresh take on Halloween. 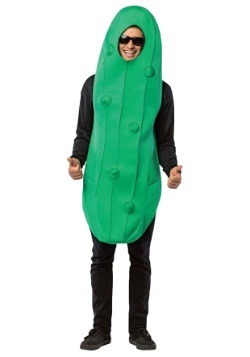 You're sure to look cool as a cucumber when you're celebrating the fresh side of life. 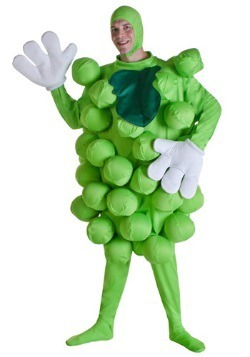 No one else thought to dress as a veggie but they might want to join you next Halloween as a complimentary ingredient. The one thing your potato costume could use is a partnering well-roasted turkey! 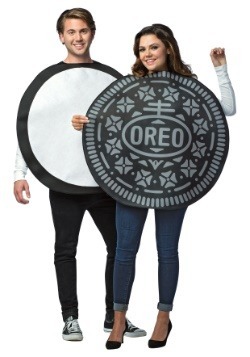 Hey, did we just figure out your Thanksgiving Day couples costume out? You’re welcome! 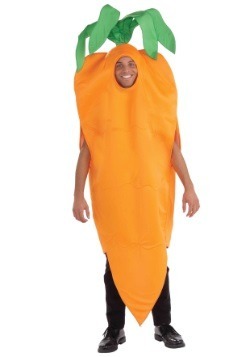 If you're into the idea of finding a costume that's both fresh and sweet then the carrot is where it's at! You'll look snappy in this bright orange carrot tunic. This simple tunic has a tempting leafy topping which proves that it's fresh out of the ground. 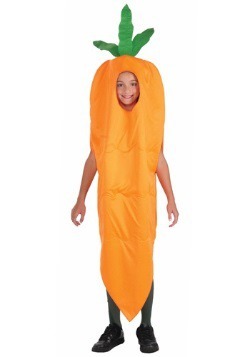 This costume is adorable with a bunny costume and would also be cute when paired with a pod of peas costume. Has your child always been ready to give peas a chance? Peas are always the easiest veggie to learn to like, even for picky eaters. They add a shot of freshness to a bowl of creamy mac n' cheese and a flash of color to your mostly white pasta salad. 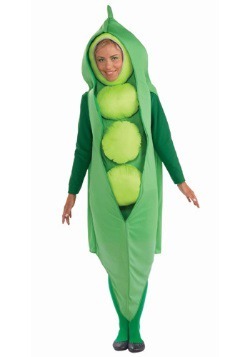 This adorable pea costume will really make a statement with its split pod and plush pea tunic design. 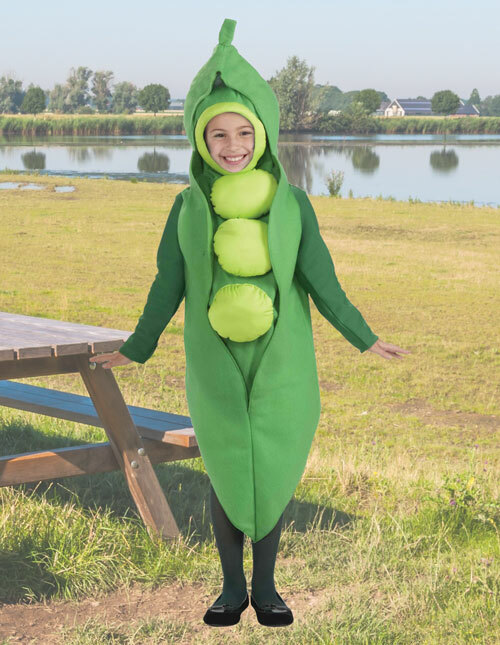 It's sure to go over well at the farmer's market or a peas march, after all your little on is all for giving peas a chance! A hilarious emoticon, a replacement for noodles and meat, and one of the only purple vegetables out there. 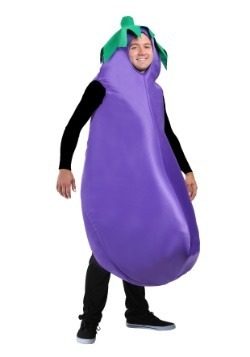 The eggplant is one of the best vegetable costumes because it'll appeal to everyone from approving health food nuts to giggling party people. This tunic has a head with a leafy cap and a rotund foam shape. 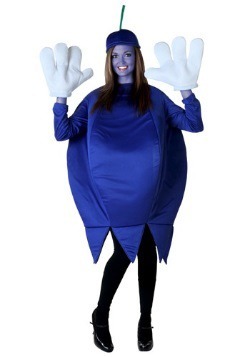 Pair it with a peach costume to make an emoticon match made in smart phone heaven (aka: some office somewhere). A favorite of Chinese restaurants and children pretending to be giants, baby corn has been befuddling minds for decades now. But the thing is, this tiny canned ingredient isn't what we're discussing at the moment. 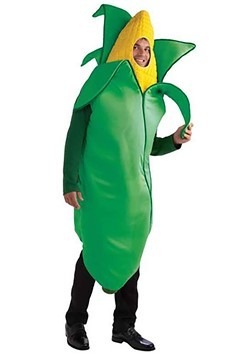 No, we're talking about your baby becoming an adorable cob of corn. Wrapped in soft textured bunting and a cozy corn husk swaddle, your little one will look fresh off the stalk! 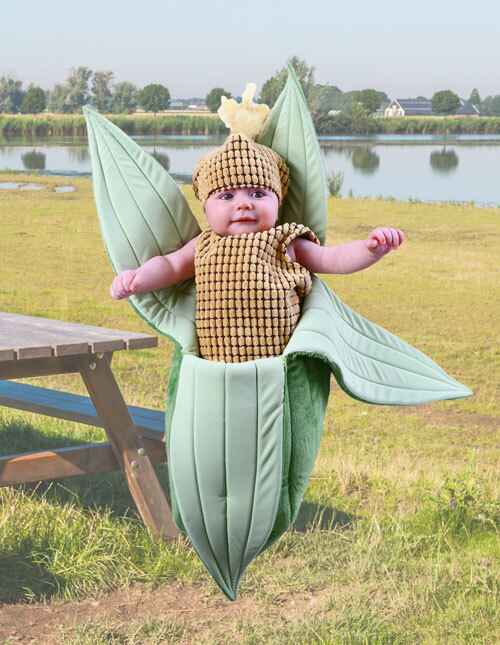 Baby doesn't have to go it alone, we've got corn costumes for folks of all ages so a corny group costume isn't too far afield. It turns out that children of the corn are much sweeter than we were led to believe by Stephen King. Yep, when your little one is all ears they will be the cream of the crop! If you're a foodie, there's nothing better than pairing foods together to create a flavor bomb in your mouth. We're looking at you, dark chocolate and sea salt caramel, you blow our minds! So, if you know someone you pair up well with, we have some delectable pairings that we all know and love. 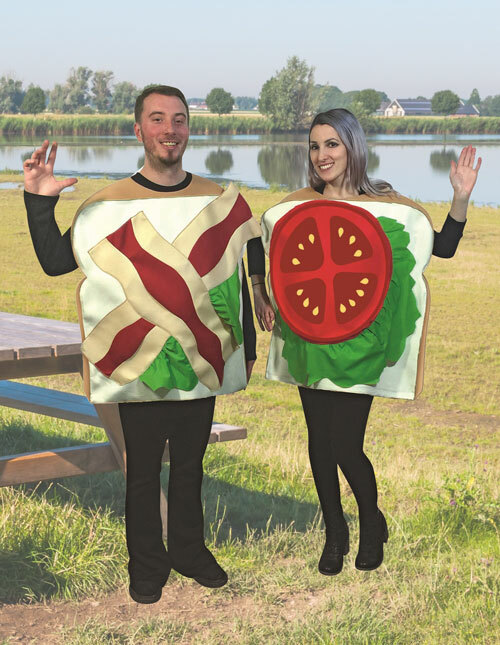 If you're a couple that's fresh, juicy, and just a little bit salty then this BLT costume is perfect for you. One side has a couple crisp pieces of bacon and a little lettuce. The other side has a juicy piece of tomato and green lettuce. 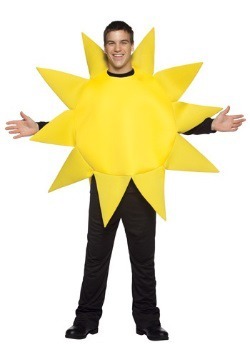 So, when you're rolling in to a costume party everyone is sure to know that you two are a summertime favorite! 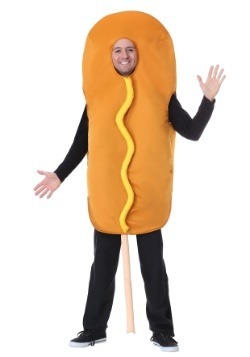 Some might call this hotdog and bun costume a little risqué but we just think it's a classic. It's the first thing you'd want to eat when you go visit New York and the only savory treat you'd want while sitting around a campfire. And together you two can represent the two parts. 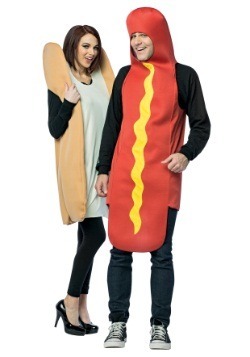 Wear it to the ball game to celebrate the classic frank, partner up with a league of other hot dogs for a group costume that no one will forget, or simply partner up for a costume party so everyone will know that you two make a sizzling couple! Milk and cookies are what every little kid wants to come home to after a hard day of learning long division. They are what we put out for Santa Claus when he's riding the night sky in the middle of winter. In short, they have a lot of memory attached to them. 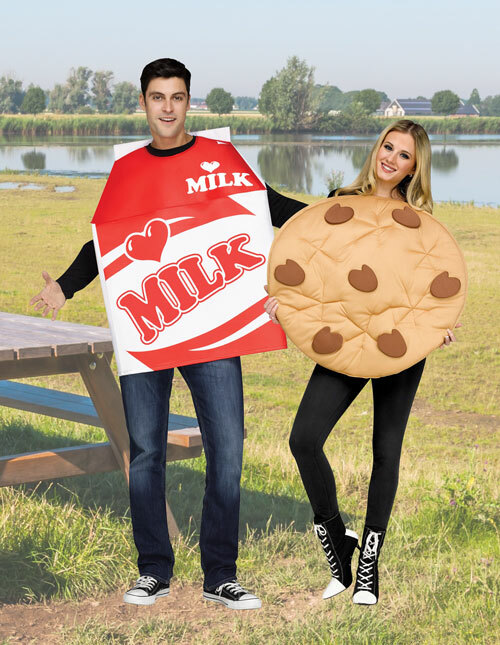 Whether you're pairing up with a friend or your sweetheart, this milk and cookie costume is sure to garner plenty of attention. Be prepared to get into a lot of conversations about cookie texture preferences or the optimum temperature of a glass of milk when you're dipping a chocolate chip treat. 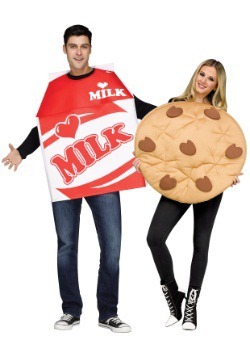 This costume features milk carton and plush cookie easy-on tunics which will make your costumes as easy and memorable as coming home to milk and cookies after a day at school. You know what time it is? That's right. . . around 2 O'clock. 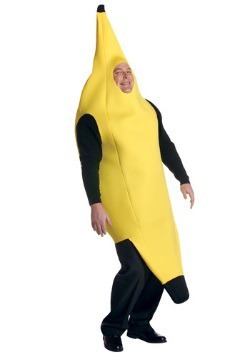 Just kidding, it's totally peanut butter jelly time. It's always peanut butter jelly time because it's a delicious treat, day or night. The combination of buttery goodness and tangy sweetness has always been the paragon of what good nibbles are made of. 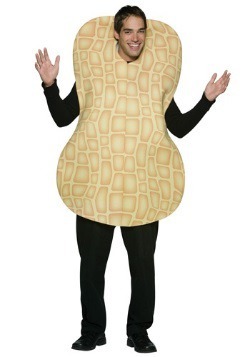 Now, you and a friend, sibling, or loved one can bring that goodness to the world with this craving producing peanut butter and jelly costume made for two. 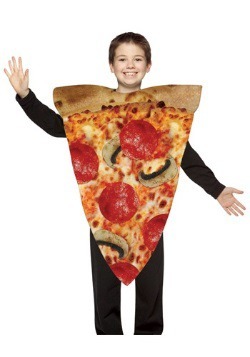 As sandwich costumes go, this is the one that'll make people sing for more! You and your paramour know how to live it up. Your weekend dates are high end. You go see the opera (well, there was an opera in a scene when you two were Netflix and chilling). You guys go for country drives on the regular, stopping at fine antique stores (or you two share a seat on the bus stopping to search for cool knick-knacks at the thrift store). And sometimes you two will get together for an elegant wine and cheese pairing (well, sometimes the liquor store gives out samples of Chablis). 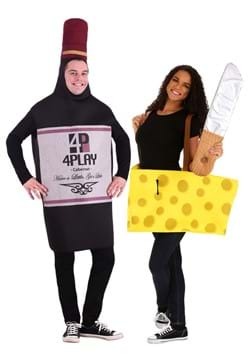 A couple that's as put together as you guys deserves a well-paired costume like this wine and cheese ensemble. 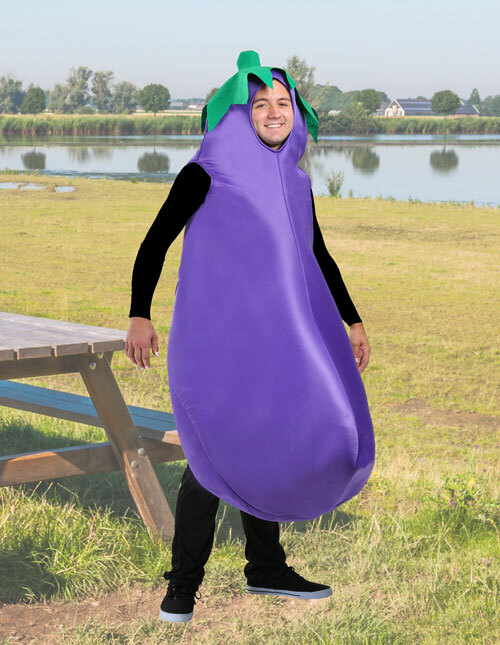 While wearing the wine tunic you could describe yourself as full bodied with buttery undertones of snozberries and a questionable mouthfeel and your cheesy partner will feel right at home with dairy-oriented puns all night! Looking for something that'll show how sweet you are on the inside on the outside? 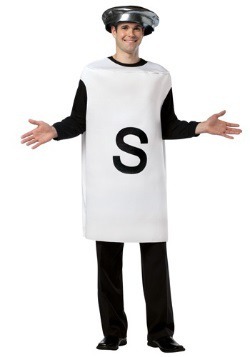 Or maybe you're looking to hide your salty soul with a cloying costume, we don't know you, we're not going to judge! If you spend your nights soaking up cupcake decorating competition shows and always have a critique of how they should have finished off their cakes (get over fondant, already, people!) 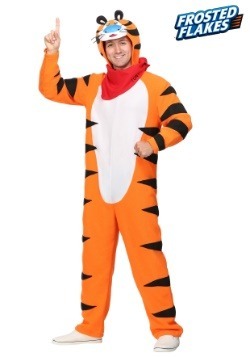 then a sweet costume will be right up your alley! 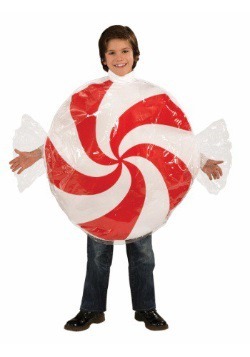 Whether you're walking in a parade in a cheery ice cream costume or you're planning on adding a rich touch to Halloween night, you'll have plenty of sugary solutions in our collection to keep your cravings satisfied. Remember how excited for trick-or-treating seeing that Hershey Kiss costume hanging in your closet got you when you were a kid? Don't "dessert" that excited feeling! 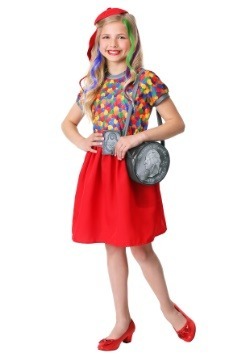 If you and your kids are heading out on Halloween night, show the neighborhood how serious you are about the "treat" part of the night with a colorful candy ensemble! 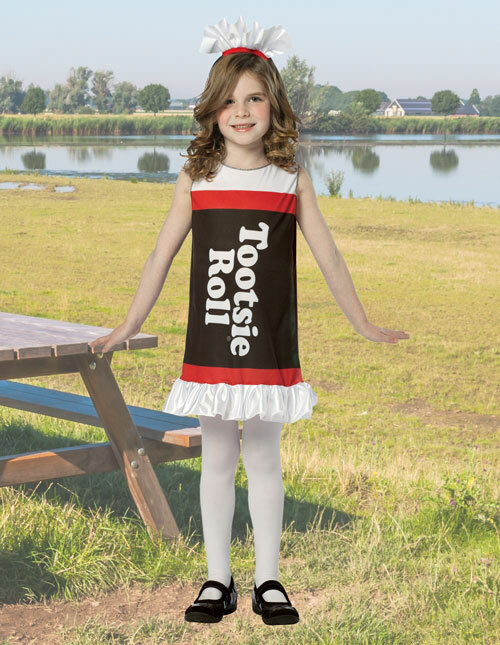 Everyone can participate in this sweet family costume from little baby Tootsie Roll to Dad rolling out “an oldie but a goodie” with this Swedish fish costume. 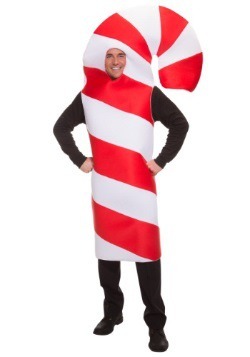 What else says Halloween like an extra sweet candy costume? If you want to tell your own fortune, there are a couple ways to go. You could read your tea leaves, cast some runes, or you could simply split open an Oreo after asking a yes or no question. Whatever side the cream is on is the answer, then you get to eat it, which is a pretty great deal if you ask us. 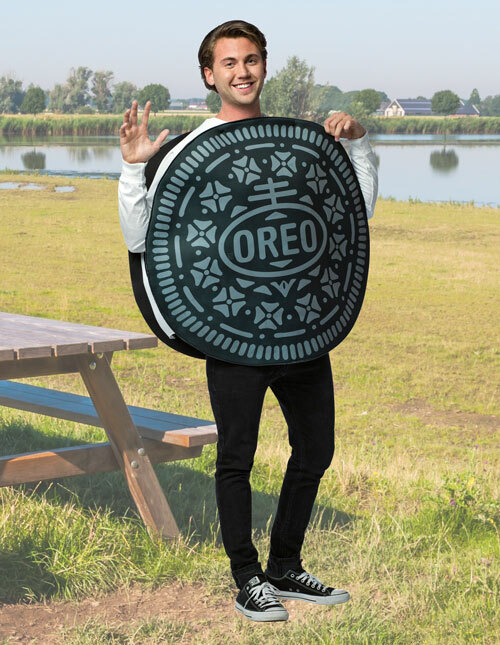 So, if you want to change up that fortune teller ensemble with a smart cookie look, you're sure to love this Oreo costume. 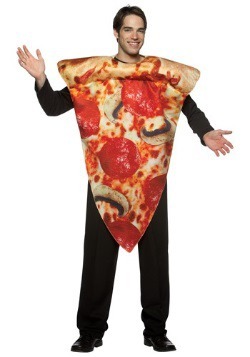 If you want to take it to another level, pair this with a tall glass of milk costume to make a refreshing entrance to a costume party. Remember when you were a kid and you got a hold of a quarter for the candy machines? Watching that colorful gumball roll down the ramp was even more exciting than chewing the actual gum. The machine was so enticing, seemingly glowing in a corner with its shining red metal surface and a globe full of multi-colored sugary balls. 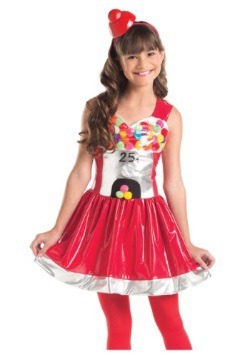 Be that beacon of joy this Halloween in a happy go lucky Gum ball machine costume. 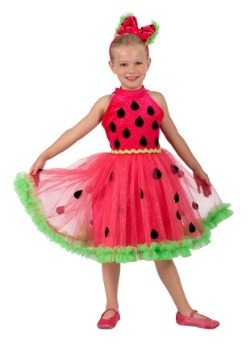 Whether you're looking for an ensemble for your child or you wanted something for a wild night out, these costumes are sweet enough to stick in anyone's memory! 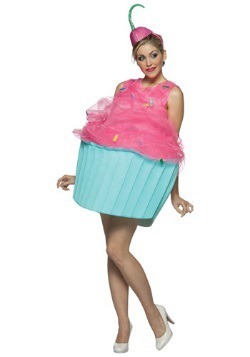 All those hours of watching dessert shows are paying off, you know all the jargon and you're ready to wow the judges in this adorable cupcake costume. 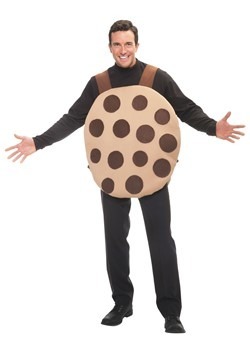 This costume is sure to make a statement whether you're heading out for Halloween, a Candy Land themed birthday party, or you're representing a bakery when it's opening. 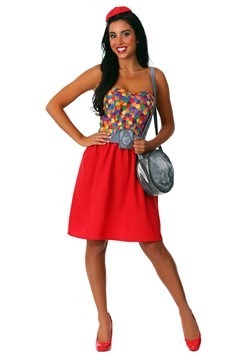 Pair this with a colorful wig and plenty of sparkles to make your entrance as sweet as possible! 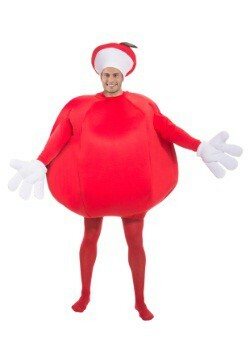 Turns out finding an unforgettable costume is, indeed, a cakewalk. 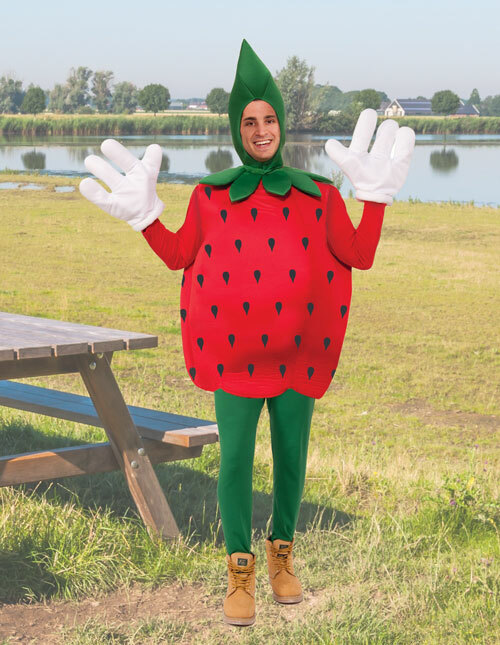 While vegetable costumes might be hard for you to swallow, a sweet banana or sweet little strawberry is, shall we say, low hanging fruit. Everyone likes fruit, from your kids to your doctor. 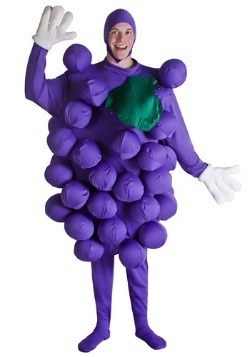 And let's be brief, fruit costumes for adults will always be a commercial hit! Isn't it nice to find something that everyone can agree on? 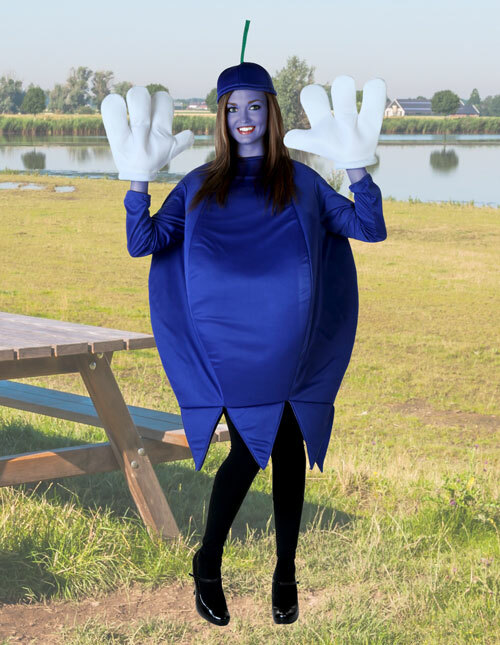 Good ol' blueberries, they've got plenty of antioxidants and they get along with everyone! 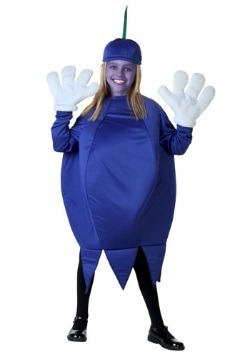 This blueberry costume gives you or your kiddo a rotund and nutritious look that pairs well with many other different kinds of fruit or works perfectly well solo. 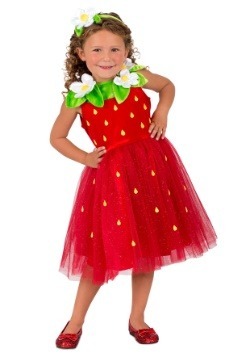 Whether you're doing a musical video for “Strawberry Fields Forever” or you simply want a perfectly sweet costume for your kiddo or yourself, you're sure to love our adorable strawberry costumes. 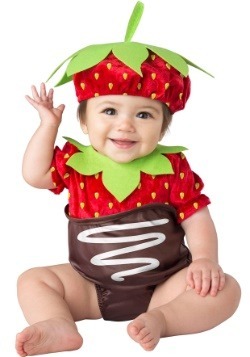 Your little one is sure to love romping around as a sweet little berry. Pumping up the jam has never been so easy! Spiky yet sweet. Substantial yet succulent. Does that sound like anyone you know? 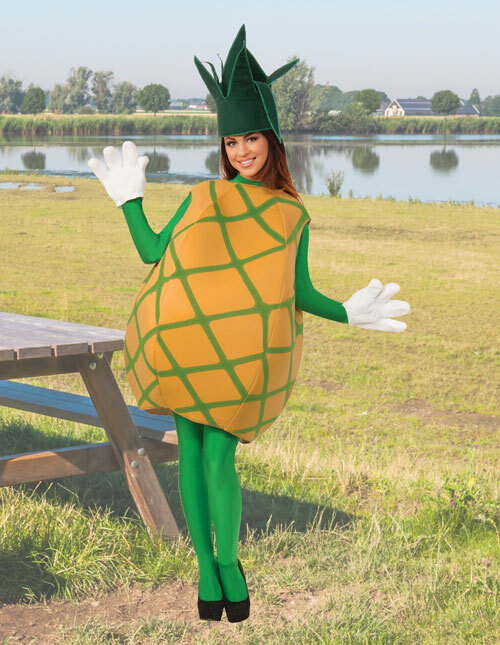 If you feel like you're a strong yet tangy kind of person that doesn't mind having a bowl full of fun then this pineapple costume is perfect for you. When you stroll in with this yellow-and-green-patterned tunic topped with a green velvet leafy hat, you're sure to feel like you're the top banana...or whatever. 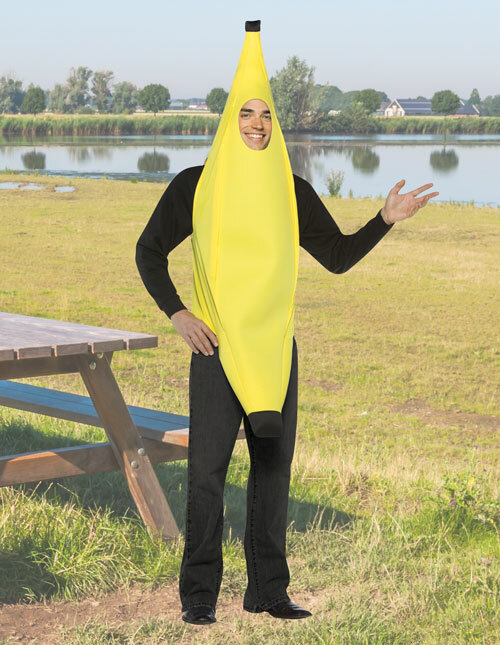 Pair this hilarious and cartoonish costume with a few other treats to put together a fruit salad, even your pup can join in with this banana dog costume. 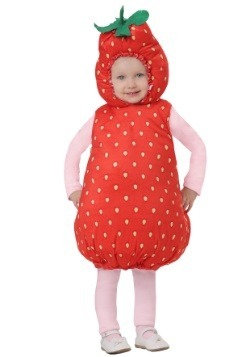 These fruity costumes will be a hit at that healthy eating school assembly or a fresh pick for Halloween parties. These prevent sore muscles after a workout, they provide their own protective packaging, they lure cute little monkeys in, and they can even be used for a comical telephone prop! 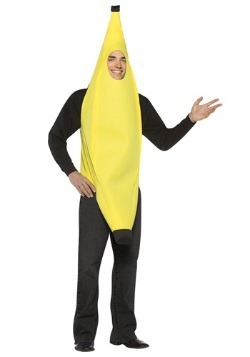 Talk about a magical fruit, when you dress in any of our banana costumes you’ll find that you pair (or should we say pear?) 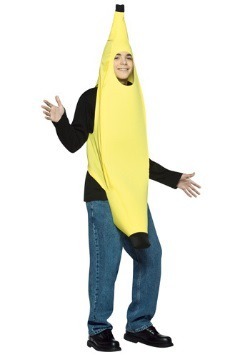 easily with monkey costumes and delight anyone with a taste for sweet yet healthy snack. Want to ramp up your look? 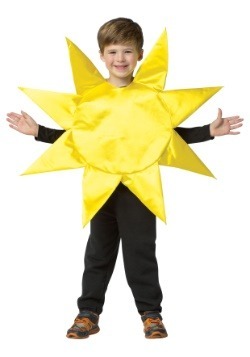 Recruit more people of any age to dress up and you guys can go as a bunch. 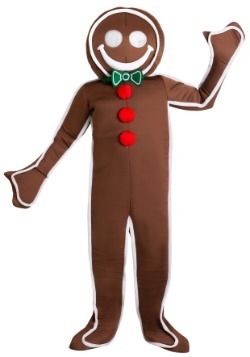 It’s a hit for 5k fundraisers and Halloween alike! We've covered all of the solids, now it's time to focus on another joy in life. We’re talking about beverages! 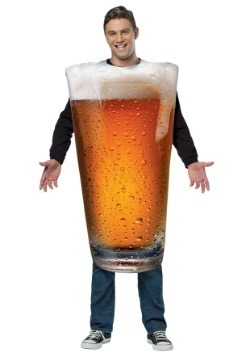 We've got plenty of costumes to choose from: energizing soda costumes to the red solo cups that star at most college costume parties. If you're looking for a refreshing take on both the sweet and savory, these picks are a great night cap to this category. When you’ve hit that 2PM lull and you’re nodding off at your desk (don’t look at us, boss!) sometimes a boring cup of coffee won’t do. 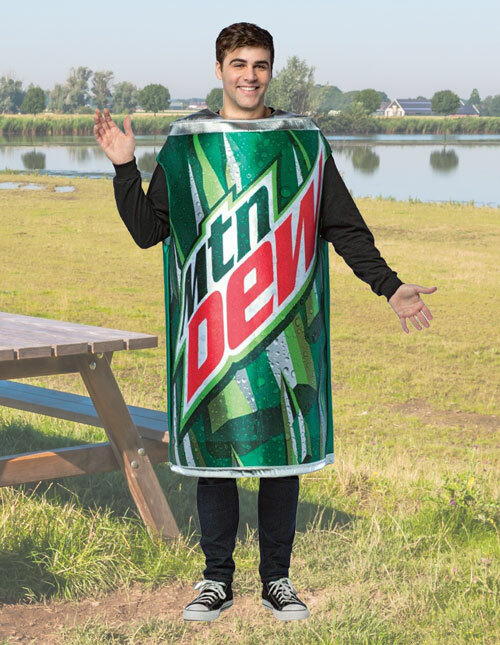 The only thing that will kick you into gear is a refreshing can of Mountain Dew. 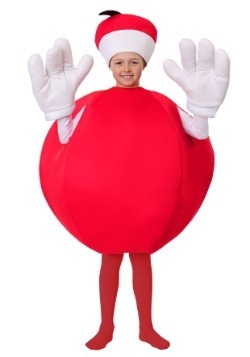 You’re sure to amp up the scene when you show up dressed as you are in this pop costume. Just a warning, though, you might give the people around you a serious case of caffeine cravings! Beer is used for a lot of things. You can use it to bribe your friends to help you move a couch. You can use it to bribe your friends to come over and watch the game with you. You can even use it to bribe your girlfriend to come to that work party with you! 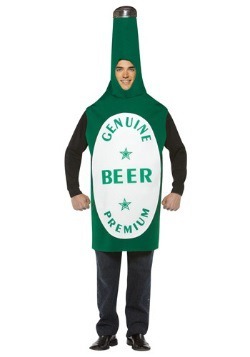 The next time you're heading to a costume party, dress as that delicious beverage we all know and love, beer. 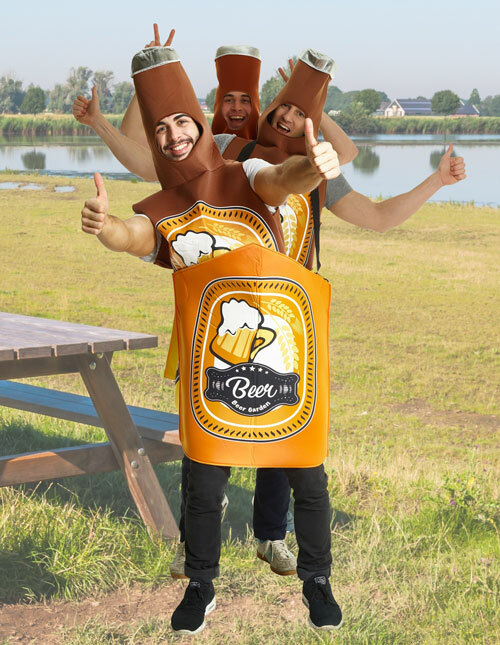 Even better, if you're heading out with some buddies, go as a pack, because who brings a single beer to the party? 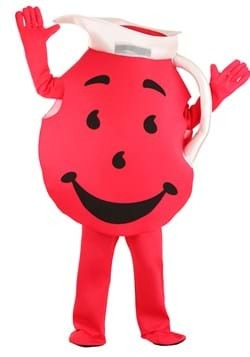 Crashing a party as the Kool-Aid guy? Oh yeah! 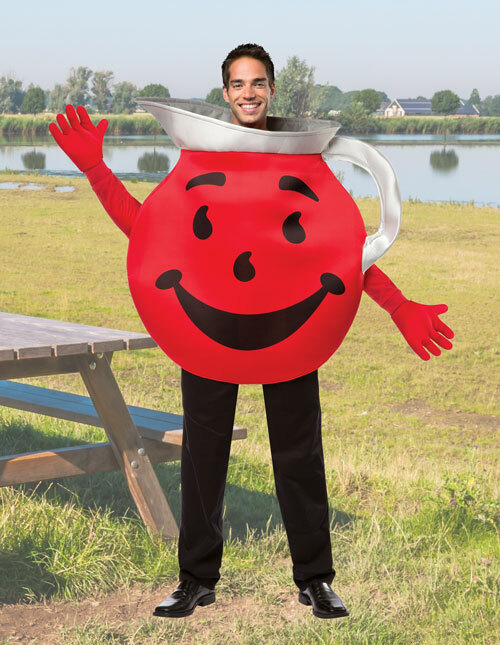 This ensemble is big and bright and is the ultimate beverage costume for many different events. You'll be the first thing kids want to see after a day of jumping on a trampoline or swimming in a pool and the last thing an uptight homeowner with brand new white carpeting wants to see. Just make sure you respect the boundaries of the wall, no one wants to deal with masonry after a costume party. While you would never caffeinate your kiddo, it's never too early to indoctrinate them to that cozy coffee shop feeling. 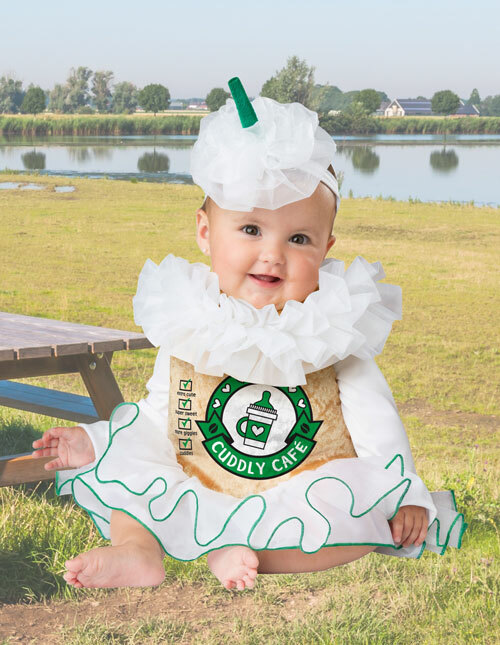 While this costume doesn't include caffeine, sugar, or any dairy products, this fluffy coffee costume is both energizing and cloyingly sweet! 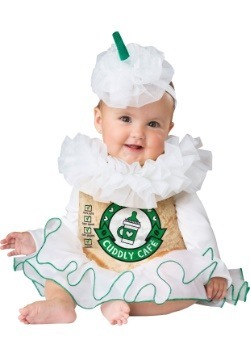 If your family is heading out trick or treating baby's fancy java jive will go well with a cookie or a barista costume.